In the midst of a specialty dining trend, Freedom has maintained complimentary dining for most of its venues. The addition of Guy's Burger Joint and the BlueIguana Cantina to the Lido boosts this model and offers variety from the standard buffet options. Click Here for time schedules for dining rooms. 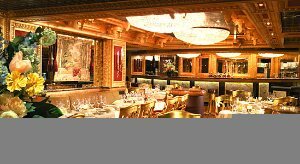 Posh (Decks 3 and 4 aft): One of two main dining rooms onboard, Posh is two levels filled with pops of red and gold metalwork depicting a blooming fruit. You eat on plates with figures that resemble the Victorian-era specters seen around the Victoriana Lounge. There's no hulking chandelier or centerpiece; overall, the space exudes casual elegance. Set seating times are at 6 p.m. and 8:15 p.m. Your Time Dining is available from 5:45 p.m. to 9:30 p.m. The dinner menu offers a variety of starters (always a hot and cold soup) and main dishes that rotate nightly, offering a variety of American fare with a few twists here and there. There's always one rotating vegetarian entree, along with the set everyday menu (steak, Caesar salad, etc. ), which includes a delightful Indian sampler that comes on two plates with papadum (lentil crackers). Special dietary requests can be accommodated by alerting your maitre'd before or at the beginning of your cruise. Along with fish, steak and comfort food, the menu features one "didja (as in did you ever ...)" menu item that invites passengers to be adventurous by trying dishes like alligator fritters, frog legs and escargot. The After Dinner menu always features a cheese plate, three sherbets, four ice cream flavors, a tropical fruit plate and the ever-popular warm chocolate melting cake. Three other options, including a "diet" dessert, are also provided. Specialty coffees, liqueurs and dessert wines are available for purchase, but plain old coffee is on the house. Posh is well used, perhaps due to aft ocean views, and it hosts sit-down breakfast, lunch, SeaDay brunch and tea, in addition to dinner. Breakfast (served 8 a.m. to 10 a.m., open seating) is basic, with eggs, French toast, fruit and cereal on the menu -- but something about having bagels and lox served to you on fine china sets a luxurious tone for the day. SeaDay Brunch (8:30 a.m. to 1 p.m.) is a blend of breakfast and lunch options (and dessert) offered on sea days, which sounded a bit better than they actually were. (The tomato soup was oversalted, and the mac and cheese left a bit to be desired, but maybe that's what you get for ordering them at 9 a.m.) Even if you don't participate in the Seuss breakfast, steak and eggs and cereal-crusted French toast are offered there. Perhaps the star of the show is the bloody mary bar available tableside or walk-up, with any combination of base and garnishes. Lunch (open seating, noon to 1 p.m.) is a complete mish-mosh of items like sushi, Caribbean dishes, salad, spaghetti, fish, fajitas and French baguettes. A create-your-own-burger option is also offered with plenty of toppings, including guacamole -- but save your beef consumption for Guy's Burger Joint. Additionally, four desserts, ice cream and sherbet are offered. The little-known Tea Time is available from 3 p.m. to 4 p.m. on sea days on Deck 4 of Posh. There is no menu, but a full tea service with dessert cart is offered; it's a lovely way to spend an hour of the afternoon out of the sun. 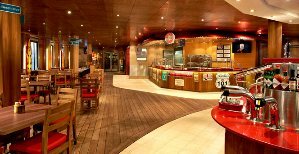 Chic (Decks 3 and 4 midship): The Chic dining room is nearly identical to Posh, serving the same menu items for dinner. You're assigned a dining room at the beginning of the cruise based on your dining time selection; Chic seems to be the main venue for Your Time diners. Chic also hosts the Green Eggs and Ham character breakfast, held on the final sea day of our sailing and available by reservation for $5 per person. If you have enough people at the table, try to order one of everything; it's worth it just for the photos. 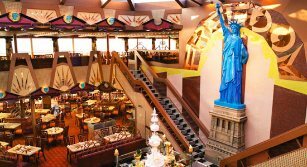 Freedom Restaurant (Deck 9): Serving as the buffet option, the Freedom Restaurant sprawls across Deck 9 and offers nearly everything you would expect for breakfast and lunch. However, it shuts down most of its food service by 2:30 p.m. Floating blue Lady Liberty heads oversee everything, and a Statue of Liberty replica looks down on the dessert station in the stairwell to Deck 10. Continental breakfast begins at 6:30 a.m., and the breakfast grill fires up at 7:30 a.m. Breakfast is available until noon for late risers. Tip: There is a made-to-order omelet counter inside, but for less of a line and more peaceful seating, try the omelet bar hidden out by the aft pool. For lunch and dinner, Chef Choice and Good Eats are the rotating options, which include items like cold salads, lasagna, chicken parmesan, casseroles, mashed potatoes and much more. Good Eats is also available 6 p.m. to 9:30 p.m. Swirls, the various soft-serve stations around Deck 9, are open 24 hours a day with ice cream and frozen yogurt. Apart from the chocolate and vanilla ice cream, strawberry frozen yogurt was in high demand on our sailing. 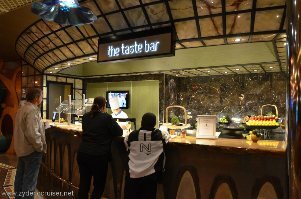 Overall, the quality of the Freedom Restaurant is fine (but just fine), and you won't be hurting for variety, but we were drawn to the specialty counters again and again instead of the standard buffet options. With so many choices (in the form of Asian, seafood, sandwiches and pizza), ordering from specialized, limited menus was fun and rarely a letdown. Comfort Kitchen (Deck 9): If you can't get enough of potato hash, chicken tenders, fish croquettes, pork steak and the like, the Comfort Kitchen answers your cravings at a counter in the middle of the restaurant, offering a daily selection of foods that might remind you of variations on regional home cooking. 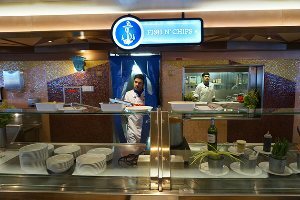 Mongolian Grill (Deck 9): Popular and always touting a long line, the Mongolian Grill provides you with a salad bar-style selection of Asian vegetables, seeds and noodles, which then get thrown into a wok with your choice of chicken, beef or calamari. Choose from a mild black bean sauce, a Thai barbeque with a little kick or a Szechuan sauce for spicing things up. Fish & Chips (Deck 10): Fish & Chips was a surprise, and as each selection comes in small to tasting-size portions, it's doable to order everything on the menu and split it between two people for a full lunch. Ahi tuna with watermelon comes in a small cup and provides a refreshing palate cleanser. Other items on the menu include BBQ octopus salad, cider-battered fried fish filets (your standard fish and chips), fried oysters, bouillabaisse and fritters made from calamari, shrimp, zucchini and Maui onion. The standout, however, is the seafood ceviche -- fresh and not fishy. The chef from the Sun King steakhouse was overseeing operations there on our voyage, which might explain the high-quality offerings. Seating is also a bit quieter up on Deck 10. Hours are typically noon to 2:30 p.m., along with the rest of the Freedom Restaurant. Carnival Deli (Deck 9): Open 12 hours a day (11 to 11), the deli is a gem for a quick bite. Cold selections include a turkey wrap, tuna on white bread, salmon on a bagel and a favorite: arugula, pepper, tomato and mozzarella on ciabatta. (Fresh -- and free -- arugula at sea is a delight.) Hot sandwiches are standard NYC deli fare: pastrami or corned beef on rye, grilled Ruben, grilled ham and cheese, roast turkey breast, chili con carne and hot dogs. It wouldn't be complete without coleslaw, pickles and a pleasantly crunchy sweet-and-sour veggie mix for sides, which line the shelves in jars behind the counter. 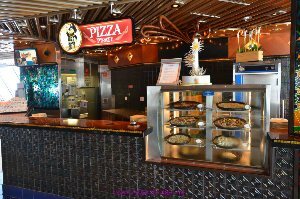 Pizza Pirate (Deck 9): The best time for pizza is any time, so Pizza Pirate stays open all day, every day. Choose from margherita, funghi, pepperoni, quattro formaggi or prosciutto pies, all made with fresh buffalo mozzarella. Caesar salads are prepared to order. The style is thin-crust, so two slices are usually served to an order. Not every pie is available at all times, so sometimes there's a bit of a wait while the pizzas emerge from the oven and the line backs up. Though the ingredients seem fresh, our slice bent under the weight of the grease. Guy's Burger Joint (Deck 9): What's left to say about Guy's that hasn't already been said? With better customer satisfaction reviews than the for-fee steakhouse onboard, Guy's burgers are hailed as delicious by an overwhelming majority, and the free aspect doesn't hurt. Go tame with a simple patty, maybe some sauteed onions and mushrooms with special "donkey" sauce from the toppings counter, or go all out with one of the listed suggestions, which feature a patty made entirely of bacon. Don't forget about the satisfyingly seasoned fries; they constitute a meal themselves. BlueIgunana Cantina (Deck 9): Free. Burritos. Sound the alarm! The cantina serves made-to-order Mexican wraps on wheat or jalapeno tortillas, with ingredients like crema fresca, tomatillos, pico de gallo and black beans. (Choose from steak, chicken or shrimp.) Glide over to the staggering salsa bar with more toppings, salsas and sauces than you've ever heard of. (Some aren't for the faint of heart.) Side salads like watermelon jicama slaw are also offered there. Fresh watermelon slices are always available in the bowls atop the salsa bar -- a refreshing way to end a stuffed burrito or taco piled high. (Choose from chicken, fish or pork for the tacos.) If you thought it couldn't get any better, BlueIguana also does breakfast, and it's arguably one the best things we had on the ship -- Mexican-style eggs, beans, salsa and hash browns (that's what makes it) wrapped up and ready to order from 7:30 a.m. to 10:30 a.m. The Taste Bar (Deck 5): Unpredictable but always fun to find, the small plates offered each evening from the Taste Bar give a glimpse into various dining venues onboard and also offer great canapes to accompany pre-dinner drinks. 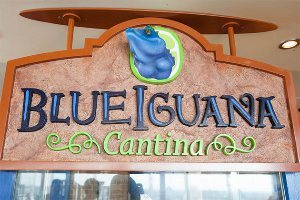 Try a bite from the Sun King before making a reservation, or get a taste of the flavors at BlueIguana with chicken, avocado and lime tortilla soup, accompanied by roast pork, green chili salsa and aged Cotija cheese. Hours vary, but Taste is only available in the evening. Room Service: When all else fails, room service comes to the rescue, 24 hours a day and free of charge (save a small cash tip to the delivery personnel, which is optional but appreciated). Hot and cold sandwiches, not unlike those offered at Carnival Deli, come with potato salad, coleslaw, potato chips or pretzels, and you have the choice of white, whole wheat or rye bread. Mixed greens, Caesar salad and veggie sticks with dip are also available. Desserts include cookies, chocolate cake, fresh fruit salad, strawberry yogurt and New York cheesecake. Available beverages include juice, milk, coffee and tea but not water. Soda and a limited selection of beer are available at bar prices. 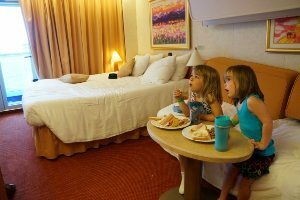 Not many dining options onboard require a charge to your Sail & Sign account. 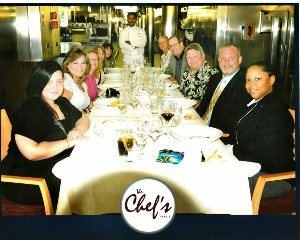 Sun King, the onboard steakhouse, offers the opportunity for an upscale evening away from the masses, and Chef's Table is a supremely special occasion with the intimate chance to meet the chef and tour the galley. Sun King (Deck 10); $35 per person: Inspired by the opulence of Louis XIV, Sun King is the steakhouse onboard Freedom. The cover charge includes a choice of starter, salad, entree with side dishes and dessert. Although the restaurant boasts an extensive wine list, alcohol is additional. Tucked away on Deck 10, Sun King offers an intimate night out away from the routine of the main dining room, and the restaurant never seems fully booked. Meals take about two hours but not because of inattentive service; course after course is leisurely presented with poise and panache. A presentation of the cuts of meat is made prior to ordering, and if you have any questions about the menu, that's the time to decide between a cowboy steak or a ribeye. Eight starters include escargot (buttery and delicious in puff pastry), tuna tartare, lobster bisque, onion soup and a flavorful grilled Portobello mushroom. Salads are Caesar, baby leaf spinach, iceberg or sun-ripened beefsteak tomato (better quality than you find in the MDR). Choose from a cut of steak or lobster, surf and turf, rosemary chicken, grilled lamb chops, lobster ravioli or the fish of the day. Available sauces are three peppercorn, wild mushroom and bearnaise. Desserts include a cheese plate, ice cream and sherbet selection, fruit, caramelized apples, a chocolate sampler and a cheesecake that's so large the waiters playfully joke that you can't leave until you finish the entire thing. 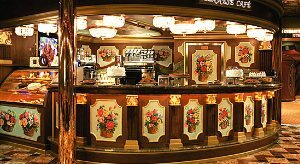 Viennese Cafe (main location on Deck 5); a la carte pricing: A latte or iced coffee throughout the day has become a modern necessity, and the Viennese Cafe answers the call with gusto. A full beverage menu (which also features alcoholic coffees) is accompanied by a bake case with tempting fruit tortes, chocolate parfaits, cookies and carrot cake, among the offerings. Try an off-the-menu coconut cappuccino (about $5, including tip). Sweets are $2 to $3, depending on what you get. Specialty coffees are also served up at the Millennium Bar in the lobby on Deck 3 and on Deck 9 at a counter in the restaurant. Ship officers and crew are often seen there getting an espresso or a cup of joe before heading back to work.